If only dogs could talk, then they would tell you to read on. Training your dog offers you and your dog so many benefits. It’s fun. It’s easy. It keeps them busy and out of trouble. We all know idle hands are the devil’s playthings. Just like that, we can explain so many of the problems owners encounter with their dogs. Beating boredom can not only reduce destructive behaviour, it also improves his mood and makes him more friendly. Not enough people know that dogs actually need to be taught what they are expected to do. From a sample of 120 dogs given up by their owners to the SPCA Malta, 40% of the owners gave behaviour problems as the reason behind it. Some have explained they were put off by certain trainers because they insisted they should punish their dogs for making mistakes, which actually made the problem worse. Through this website you’ll find information about dog behaviour and training that can help you achieve better behaved dogs using positive reinforcement methods and good old common sense. It is just a fancy abbreviation for “good boy Buddy! Here’s some chicken”. All those behaviours you want your dog to do can be achieved through reward based training. Furthermore most behaviour problems can also be overcome using reward based training. What you must keep in mind though is that from here on we will not be focusing on how to stop a dog from doing something. We will be instead focusing on how to teach it something else to do – something that we want to see – and this will get in the way of him doing the million (and one) things we do not want him to do. Whether you have just bought or adopted a puppy or an adult dog it will already come with basic toilet training. The mother would have pushed the puppy out of their bed when she knew they needed to toilet, thus showing them they should do it out of their sleeping area. The only true differences between puppies and adults in this matter are the length of time they can hold it and the length of time they’ve been doing it a certain way. Puppies cannot be expected to hold it for very long. Taking them out every four hours or less will give them a number of opportunities to get it right. After they’ve had a drink, eaten, been playing or been asleep are the most common times they will need the bathroom. Letting them get it right and rewarding them for toileting in the right place will ensure they will continue to prefer that place. What you don’t want to do is let them get to that point where they can’t hold it anymore. Preventing it is better every time. If they should have an accident, do not make a fuss about it. Just clean it up well so it doesn’t smell like a toileting area and carry on with your day. Punishing them will create more problems in the future such as the dog learning to wait until you’re gone to go to the toilet. Then you won’t be able to reward for getting it right because you’ll never be there. Be realistic about what your dog can understand. If you’re expecting him to do it in the yard where the tiles are similar to what you have indoors, you may be setting yourself up to fail, and it won’t take very long till he starts thinking the floor is the toilet. This is like trying to locate the one functional bathroom in a warehouse full of display ones. It can be quite tricky. Some older dogs may be afraid to do it on a lead. This may be because they’ve been punished before and don’t want to do it near people. Find a safe open area near you where you can either allow your dog to run around or to fully extend a retractable lead. The dog will probably choose to do it as far from you as possible. Make sure to reward him every time and as time goes by you may start to move closer or the dog may start reducing the distance himself. As long as you continue providing him with the opportunity to get it right and rewarding him for it you will see improvement. Letting him get it wrong means you’ve also missed the opportunity to reward him for getting it right because there is only so many times a dog will need to toilet every day. That could make training slower than it should be. Remember feeding your dog at regular times every day will also mean he will need the toilet at almost the same time every day. Use this to your advantage, and move the feeding time, if your dog’s toilet time does not fit with your schedule. Teaching your dog to come to you is an absolute must. You need to be able to call your dog to you in case he is in danger or is getting too far and quite simply because you need to take him with you when you’re leaving the park. Dogs need to have a run off lead, it’s both fun and good exercise, so making sure they come when they’re called makes that possible and safe. It would be very sad for Fido not to get a run just because you couldn’t train him. It is important to recognize that until you know you can reliably call your dog back to you, you should not allow him to run off lead in a public place. If your dog doesn’t respond consistently to his name you may need to start by teaching his name. When you start training hold some treats or your dog’s favourite toy in your hand, low where the dog can reach it without jumping up, get his attention by calling his name and walk backwards, making a fuss as you go, so he’ll follow you to get his reward. Reward him with the treat or toy when you stop and he comes to you. The dog is learning that coming to you is a positive thing. Introduce a command, like “come” or “here”, when he’s coming every time. Call his name to get his attention and while you’re walking backwards as he’s starting to move towards you, say the command. Do not say the command if you don’t know for sure he is really coming to you or this will just become another word he hears a hundred times a day. If you can get a friend to help you, it’s fun to practise your dog being called from one person to the other, getting a reward every time he arrives. When it has become a consistent response to the command you can start training in new environments, importantly including outside. Do not let your dog off lead just yet as the outside distractions may make him forget the command at first. Use a retractable or a long lead. Practise in a safe enclosed outside area when you first start practising off lead to keep the dog safe. You’ll need to start over as you had inside the house. Again, do not say the word “come” or “here” unless you know for sure he is coming to you or it will loose its meaning. Practise in many different places and often, and increase the value of the treats as the distractions increase. Make it really worthwhile for your dog to come to you and it will make him more reliable when it counts. Unless you have huskies pulling you on a dog sled, you probably would not enjoy being pulled around by a dog, especially if you are lighter than the dog that is walking you. Dogs may pull on the lead for many reasons. Perhaps they are following a scent or they have seen something they want to investigate. Some dogs will just be trying to get to their toilet spot because they can’t hold it any longer. They might simply be in a hurry to get on with it. For any dog and owner this can be dangerous. The obvious thing is suffocating and damage to the neck because of their collar, but they may also step ahead of the owner into traffic or into a gate with an unfriendly dog. It is safer even for the owner if the dog learned to walk nicely on the lead to start with. The first thing you must remember is not to reward unwanted behaviour. Moving faster when the dog pulls gets him exactly what he wanted and will encourage him to do it again. The best thing is to stop and calmly wait for the dog to loosen the pressure on his collar. When he does this you can start moving forward again. This way the dog learns pulling gets him nowhere quickly, walking nicely gets him there faster. While you’re at home you can teach the dog to walk near your sides by luring him to walk next to you with a treat. Lure him to walk by your side using treats and keep rewarding him with little bits of his favourite treat to let him know he is doing well. Once the dog is doing it well inside you can slowly increase the level of distractions and eventually practise the same on your walks. Using a clicker you can teach him to walk at your heel even quicker here. It is fairly easy to train your dog to sit when you ask it to. Start training a reliable sit at home when there aren’t any people so the dog is not forced into a situation where it is too excited and distracted to listen. You can lure a dog into a sit position by moving a treat over its head. As he looks up at the treat, his bum will have to go down. Give him the treat as soon as his bum hits the floor. When he has learned this way you can introduce the command just before he sits down so he gets used to the command always being followed by a sit. The more you practise this the better he’ll know it so you can ask for a sit the next time round. Be happy if your dog is so happy to greet people, even strangers because this means he is friendly but he just doesn’t know it’s rude to jump and put his paws on people. The reason we don’t want him to do this is because we think it’s rude and dangerous because it could make us fall over. It is a perfectly natural behaviour for a dog. If this is what your dog does, tell your friends not to encourage him to do it but ask them to bend down so the dog doesn’t need to go up to greet them and tell them to stay as calm as they possibly can because any excitement will also be mirrored by the dog, even if it is shouting at him to get down. You can also teach a dog to greet people nicely by staying on all fours next to them. First teach your dog to sit following our advice here. This will give him a clue as to an ideal behaviour to perform when greeting people. Then set-up a situation with low excitement for your dog , this might just be you or a family member coming back into the room, and give him a reward, a treat or a cuddle, when he either sits or just having all his paws on the floor will do. 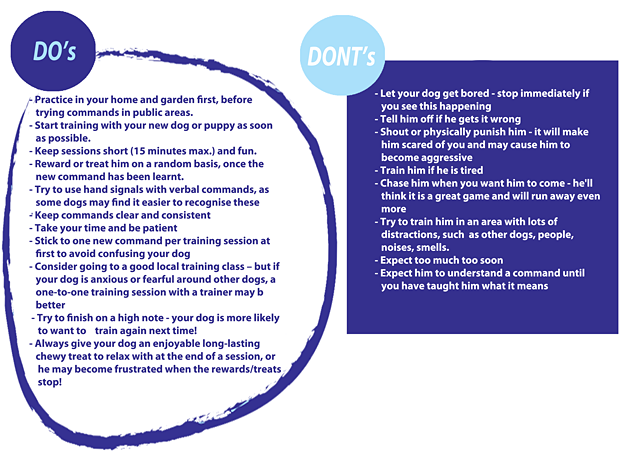 You can choose which behaviour you would like to reward, but try to be consistent with what you expect of your dog. After he has learned the sit or keeping all fours on the floor is a good way to behave at this low level of excitement, you can start to increase the excitement of the situation. Leading up to the times when he is usually most excited to greet people, again waiting until he gets all four paws on the floor or sits to give him a treat or a cuddle. Remember to help him to succeed by asking people to stay calm and bend down to greet him. When they stand straight again and the dog will probably put his paws up again. Wait patiently and calmly until all he repeats what you’ve taught him and then praise and reward. If you would like him to sit when he greets people you can use the command to ‘sit’ once you have spent plenty of time training this in different places and you are sure your dog knows what you mean – remember he doesn’t speak your language so he needs to learn what sit means. Practise this several times and practise with different people. Practise outside when you run into strangers. Remember the more different situations you practise this in the more the dog will remember this is what he should do everywhere. If you want to improve your dog’s behaviour further you can also train him to settle down on a special mat. The only thing special about it is that is its only function. It can be quite simply a used towel, which makes it easier to carry around the house. This will be his signal to settle down on it and calm down, so you will always use it to train calm sedate behaviour. Once he has learned this you will need to practise again in different rooms and provide loads of rewards for getting it right. This also needs to be a safe place for the dog, where he is not called away or annoyed in any way. This is mostly an issue in a household with kids. Tell your children that they need to act calm around the dog so he doesn’t get overexcited.